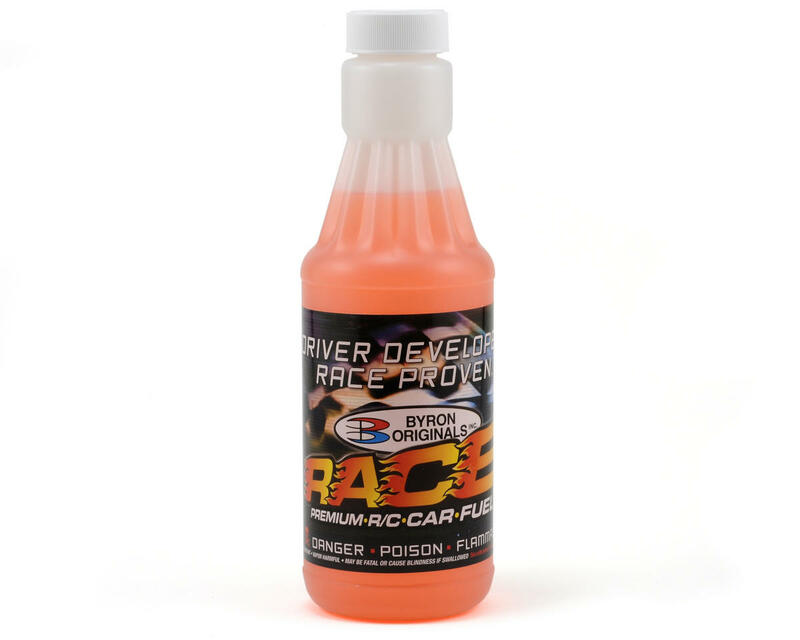 This is one quart of Byron Originals 30% RACE 2000 Gen2 Car Fuel! Byron Originals Gen2 Nitro Fuel is a revolutionary new car engine lubrication system that will, without question, represent the largest and greatest improvement in R/C car fuels the industry has witnessed in the past 15 to 20 years. The process that ended up in the development of Gen2 Fuels began nearly 18 months ago with an initial strategy session between one supplier, one industry expert and our own staff. We aimed to increase all aspects of performance and at the same time increase all levels of engine protection. Until the development of the new lubrication package that is the secret to Gen2 success, these two goals did not peacefully co-exist. Lower oil contents were always the answer for increased power and lower oil contents always ended in shorter engine life. The key to Gen2 is a revolutionary lubrication package. We have incorporated several features that have been proven in full scale racing and the result is a lubrication that finds its way around the engine with less restrictions. The increased flowability of the lubrication package allows the engine to release more power at leaner settings and at the same time lubricate the engine more effectively and efficiently. Product evaluation has taken place not only in the US but in the Far East and Europe as well. Original formulas were tested, reformulated, tested, improved, tested and further improved. The final steps were to fully evaluate the new Gen2 Fuels under the most excruciating race conditions — both on-road and off-road. The products as they are soon being made available, have been praised by our testers and evaluators. And some of the evaluators were not using Byron Fuel at the start of the test program but have made the switch since being involved in this program. We offer these products to our customers with the highest degree of confidence. Good results so far after four quarts through the Novarossi P5 in our JQ 1/8 scale buggy. Broke in the motor on the 30/11 fuel and then switched over to the Byron 30/9 (30% nitro - 9% oil). Good stuff! After using Trinity Monster Horsepower variants for about the fits gallon of fuel though my .12 buggy, I switched to this fuel. At first, It ran poor, however after changing to a colder plug, and getting a little more aggressive in the fuel curve, I must admit, it is a difference of night and day. I really think if you havent, you should try out a quart and see what it can do for you! 0 of 11 customers found this review helpful.